Database Performance Analyzer for AWS gives you a comprehensive view of every aspect of the system affecting performance—wait times, server resources, storage system metrics, database operations, SQL statements, and more. You can easily correlate data to performance to quickly identify what is slowing down your applications. Database Performance Analyzer for AWS provides performance-oriented developers and DBAs with the power of Multi-Dimensional Performance Analysis™. The agentless collection engine allows you to scale by keeping overhead to less than 1% on monitored instances and databases. Don't lose visibility just because you're deploying in the cloud! Easily find, analyze, and optimize the most important queries and AWS workloads with DPA. 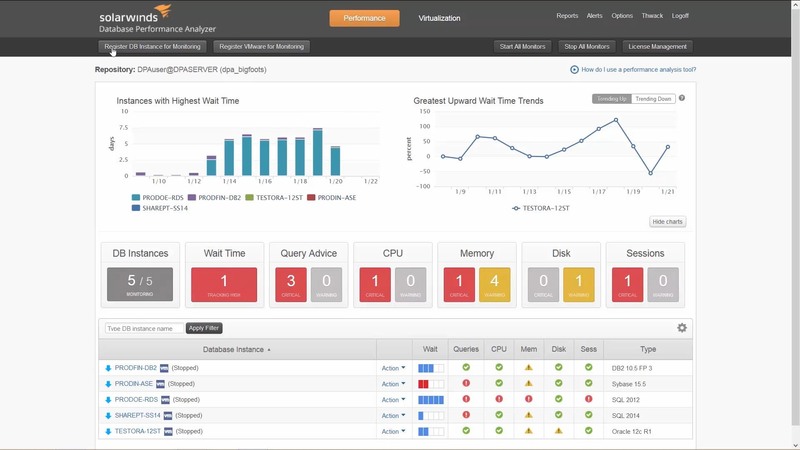 Use wait-time analysis coupled with machine learning-powered anomaly detection to visualize and alert on spikes, as well as know when wait patterns deviate from the norm or what is expected. When found, use the query level performance analysis to understand what changed that is now causing a given query to run slower than before. Use our expert advisers to tune and optimize your workload, eliminating inefficiencies that can reduce resource requirements and lower cloud compute costs. Learn more about the benefits of Database Performance Analyzer for Aurora, MySQL, Oracle, and SQL Server. If you'd rather use perpetual licensing, no worries. You can BYOL (Bring Your Own License) for your Amazon DPA image or on-premises installation of DPA. Email us at sales@solarwinds.com to get started. "My promotions and pay raises over the last few years are, in part, directly attributable to Database Performance Analyzer for SQL Server. I owe you a few!" "IT Director at Fortune 200 Bank"